Light inside cloud moved and seemed projected from above. through the cloud layer.I thought it was the moon and just drove on for about a mile. length of the top of my windscreen in a slit second and was gone. Maria exclaimed "
minute in time. This was about one mile from Silbury Hill. August 4, 2009 - Noon. does not show this object. I would like to email it to you for your comments. this new glyph whilst we were there. checking through all my pictures for orbs and anomalies that I spotted this. When I zoomed in on the shape, it appears to me to be 'saucer-shaped'. relative to the darkest center which is consistent with motion blur. "UFO sightings" that include photos of objects unseen by the witness. ago. They show much more detail that this does. and took this photo. Copyright: Colin Andrews. 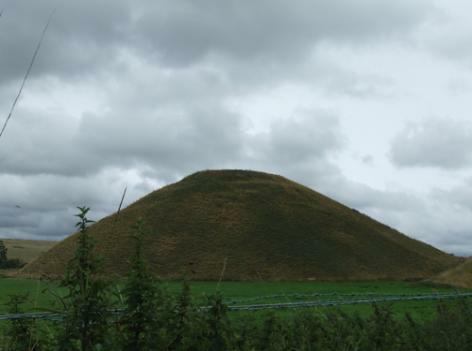 The original photograph of Silbury Hill. Object in sky on left. Copyright: Stephen Morris. British newspaper, Western Daily Press. strict copyright which was also disregarded by the newspaper. it near a famous ancient monument earlier this summer. 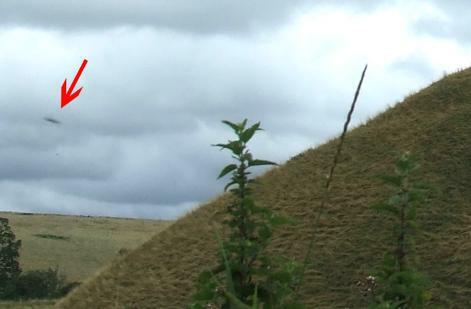 near Avebury on July 6 this year. examining an elaborate crop circle which had appeared days earlier. "I received a call from a contact within Wiltshire Police," said Mr Russell. They seemed to be inspecting the crop. sound not dissimilar to static electricity. was moving gently close to where die noise was. "He shouted to the figures who, at first, ignored him, not glancing at him. "When he tried to enter the field they looked up and began running. "He said, 'They ran faster than any man I have ever seen. "I'm no slouch but they were moving so fast. 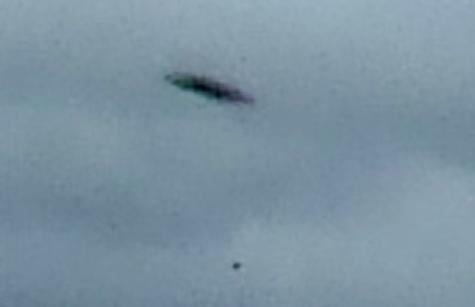 Marlborough, including sighting a UFO and claims of poltergeist activity. matter for the alleged officer, and nothing for the force in general." information to say this is something in nothing." A caller into the popular US radio program Coast to Coast 13 December 2009.
is from the last hour of Coast to Coast AM radio. Thank you for all your amazing research on Crop Circles and UFO's. I am very much looking forward to the new season. you are familiar with his work , as you mention him on your website. race originates from a location near but behind the Arcturus star system. have larger-than-human eyes which wrap part-way around the side of their head. finger nails but rather in harder, two-inch-long claw-like appendages.